On Sunday November 6th my mom threw a baby shower for our second little boy. I still can’t believe how beautiful the whole day was. So much love and hard work went into so many tiny details that made the celebrations as wonderful as they were. I was a bit nervous before the day arrived. 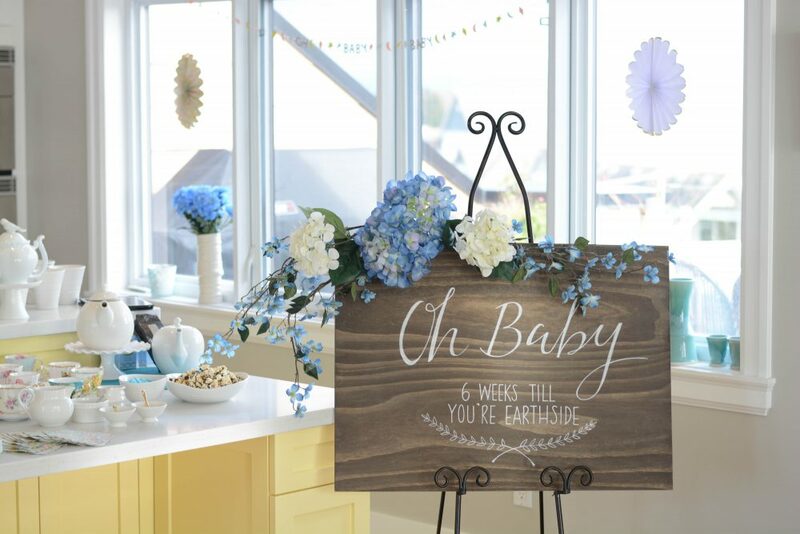 Our baby shower for Reid was such a big moment for me not only in my pregnancy but also in life. In some way it felt like a rite of passage. I had my own friends there but also had some of their moms and my mom’s friends there too. Having women who had journeyed through pregnancy, childbirth, and motherhood before me who were there offering advice and sharing stories was such a special thing. However, I knew that having the same atmosphere would also be difficult this time. For every unknown product that was explained to me and every experience with a newborn or toddler that was shared I felt a wave of sadness over the fact that these things were still so foreign to me. These moments passed quickly though, as the reality that Reid was never supposed to give me this knowledge seems to have become some kind of normal now. But it still had me missing my firstborn son and realizing that these difficult moments will just keep coming as we journey through each milestone with this second child of ours. Despite—or maybe because of—the emotions that come with a pregnancy after loss, the whole afternoon was exactly as I’d imagined it would be, and it was entirely perfect. The games were a blast, the conversations meaningful, and the food was absolutely delicious. Above all, I’m just so glad that we were able to gather and celebrate this baby in the same way that his big brother was. His life inside my belly has been filled with love and I know that love will only continue grow once we finally get to bring him earth-side. For one of the fun low-key activities, these diapers were set out for each guest to write a little note on so that Aaron and I can read them during late night changes. I have them all set up in the nursery and I really can’t wait to go through them! For the games, Micaela and Hanah had two mix-and-match ones planned. The first was called “Who’s My Mother” where we had to match the name of the animal with the name of its offspring, like a goat has a kid, etc. The whole room would erupt with laughter whenever someone cried out something like, “Oh boy! What the heck is a cygnet? !”—for the record, I now know that a cygnet is a baby swan. The second was matching the celebrity with the (very odd) name of his or her child. I’m not sure what kind of rock I’ve been living under but I had no idea that Michael Jackson named his son Blanket! This bunny says “I love you right to the moon and back.” I love how there are all these ways that Reid can be made a part of his little brother’s life. For favours, my mom gave these small plants and made up some adorable tags to go with them that said “watch me grow”. Mine now lives on one of the shelves that Aaron made for baby boy’s room (more about the nursery later!) and it’s a sweet reminder of this special day we had for him. We are so spoiled with the loving community that surrounds us and couldn’t be more grateful for their support. So many people came together to make this day happen. Thank you to Hanah for making the “Oh Baby” sign. And thanks to both her and Micaela for helping with the games—they were so fun even though none of us knew any of the answers to their ridiculously hard questions! Thank you to my sister Rebecca for helping with the setup. Thank you to Micaela, Rebecca, and Brittany for taking time throughout the day to take my camera from me so I could be in a few photos! Thank you to Julie Christine Photography for taking our maternity photos that were displayed around the room. Thank you to my mother-in-law for baking some delicious jalapeño and bacon mac and cheese! And endless thanks to my mom for dreaming up this day where the women from all the different corners of my world could come together and honour this new child and the next chapter in my life. She put in so much work to make this day happen. From the decorations to the cooking and all of the sweet details in-between, it was beautiful. And then of course, thank you to everyone who showered baby and I with love from near and far on that day. We are blessed!